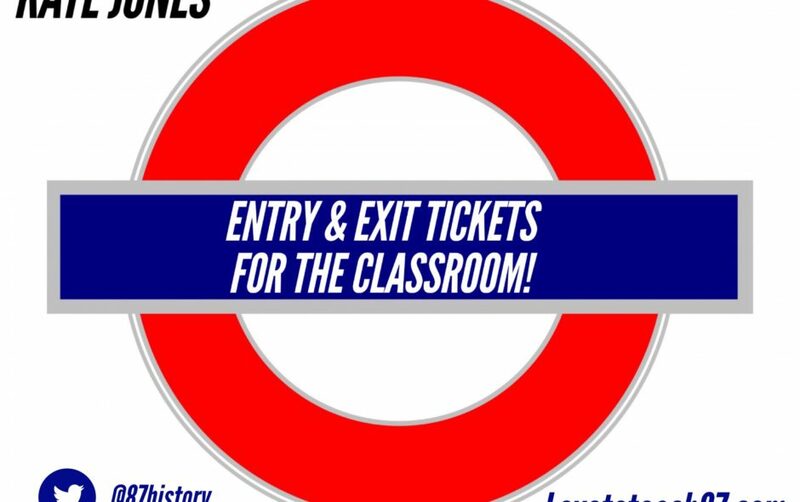 Entry & exit tickets for the classroom! I often use entrance and exit tickets with pupils at the start and end of a lesson. They are fantastic for setting targets, assessment for learning, an opportunity to express learner voice, consolidate learning and reflect on the lesson. Entrance and exit tickets are often very quick, simple and easy to use yet effective. Entry/exit tickets can be made to be generic so they can be used for any topic, subject and year group. 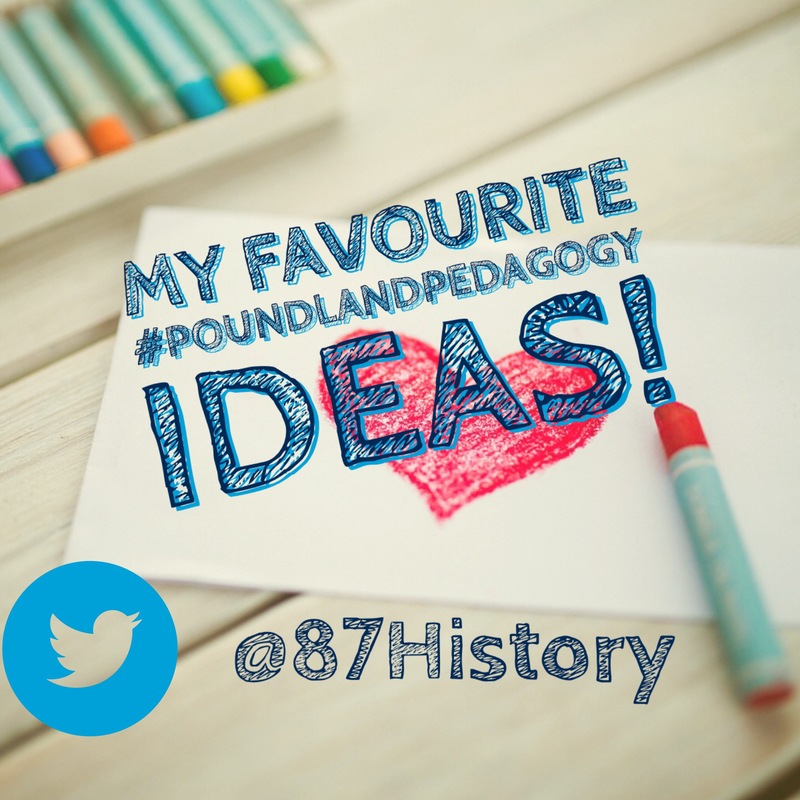 They can also be personalised for a specific topic, lesson or individual too. 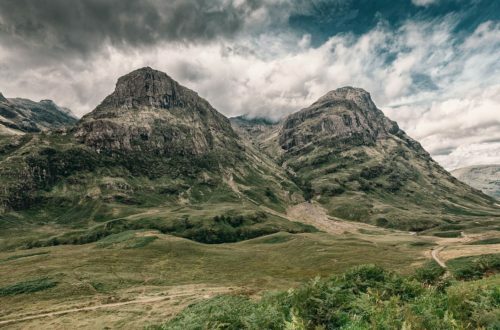 I discovered the exit ticket idea on Pinterest – a haven of wonderful teaching resources shared by teachers – and then I created and adapted several of my own to use with my pupils. In another post I have written about my popular emoji exit ticket, you can read here. Below are some other examples I have created to use in my classroom. I have adapted this plenary in lots of different ways. 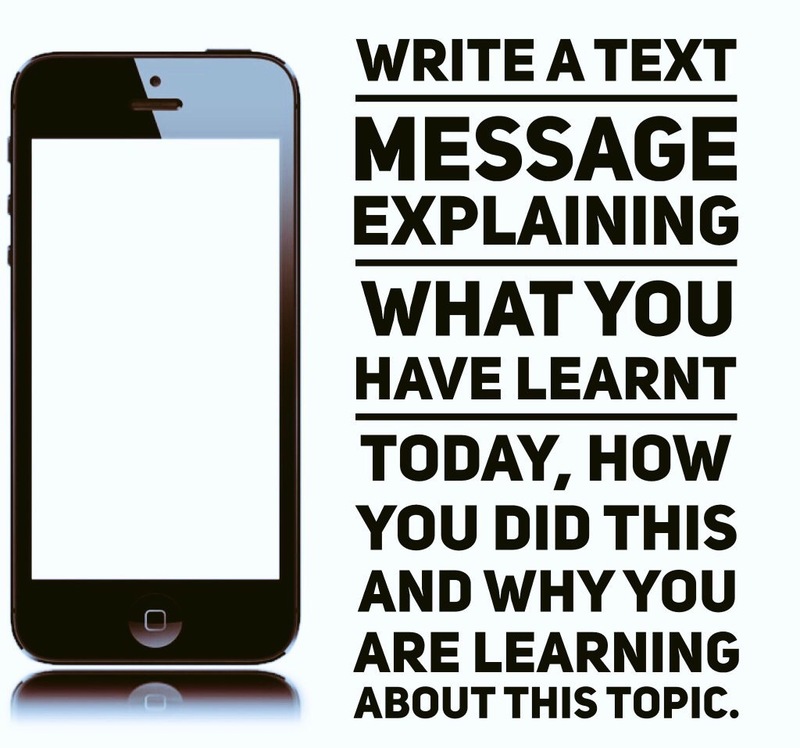 An idea from Ross Morrison McGill aka @TeacherToolkit, shared in his wonderful teaching and learning book 100 ideas, to consider different aspects when reflecting on the lesson. This resource is available to download from Danielle Bartram’s website missbresources.com. This is a simple yet effective way to gauge student understanding. This resource is easy and quick for students to complete. The end of a lesson can often be very rushed so this type of exit ticket can lend itself very well to a plenary activity. 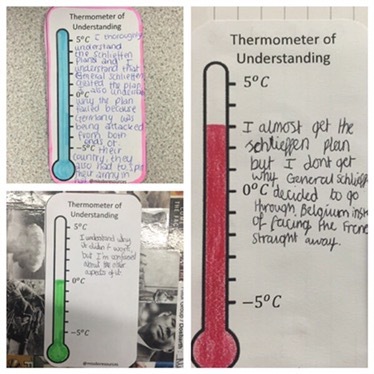 Students simply colour the thermometer up to the point to show their level of understanding or confidence. 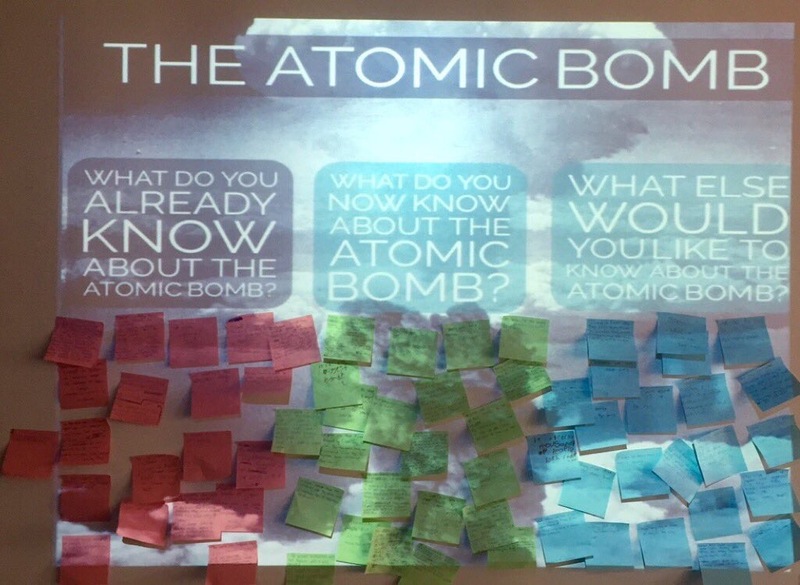 Then students can also provide an explanation as to why they have coloured up to that point, perhaps linking into what went well and even better if… This self assessment is very good for students who may struggle to express or articulate how much they have understood in the lesson. The explanations provided were useful to help aid my future planning. Inspired by Danielle’s thermometer I created the Percentage Plenary. 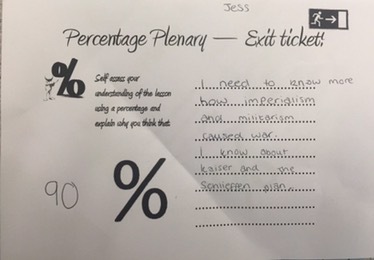 Again, not a numeracy task, but students use a percentage as a method to self assess their level of understanding and again explain. The example below shows the student chose to assess her level of understanding as 90% explaining she did well in the lesson, understanding most elements but explained there was still one area/topic that she was still unsure of. This can help the student to focus on a specific target for next lesson. This also gave me an insight as to how my student was feeling and how I could provide further support next lesson. 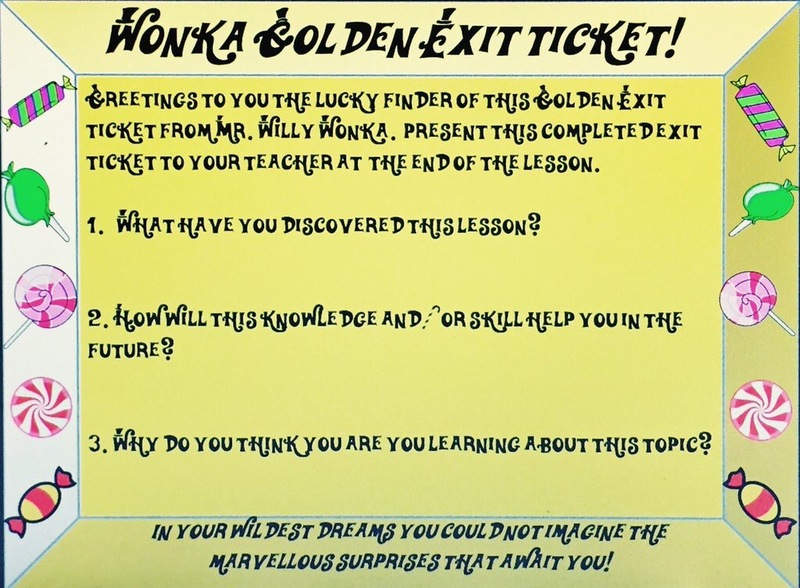 I made this ticket using a Willy Wonka font (which can be downloaded for free at Dafont.com), however it was pointed out to me that some students may struggle reading the font so adapt and differentiate to suit the needs of students in your class. A fun twist on the exit ticket again using What? How? Why? 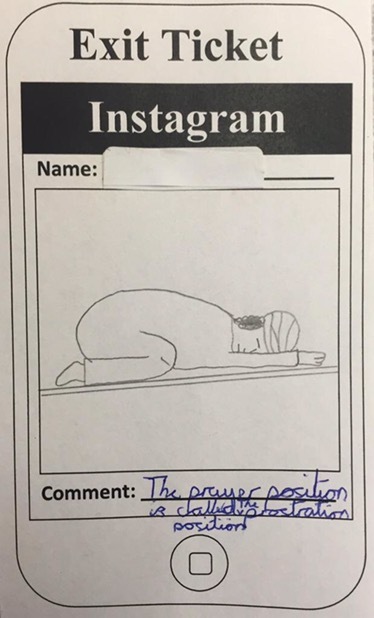 My Year 7 class particularly enjoyed filling this in at the end of the lesson! This example shows how I often use the What? How? Why? reflection but using different templates and ideas. As a self-confessed comic book geek I made this for myself and the students to enjoy! 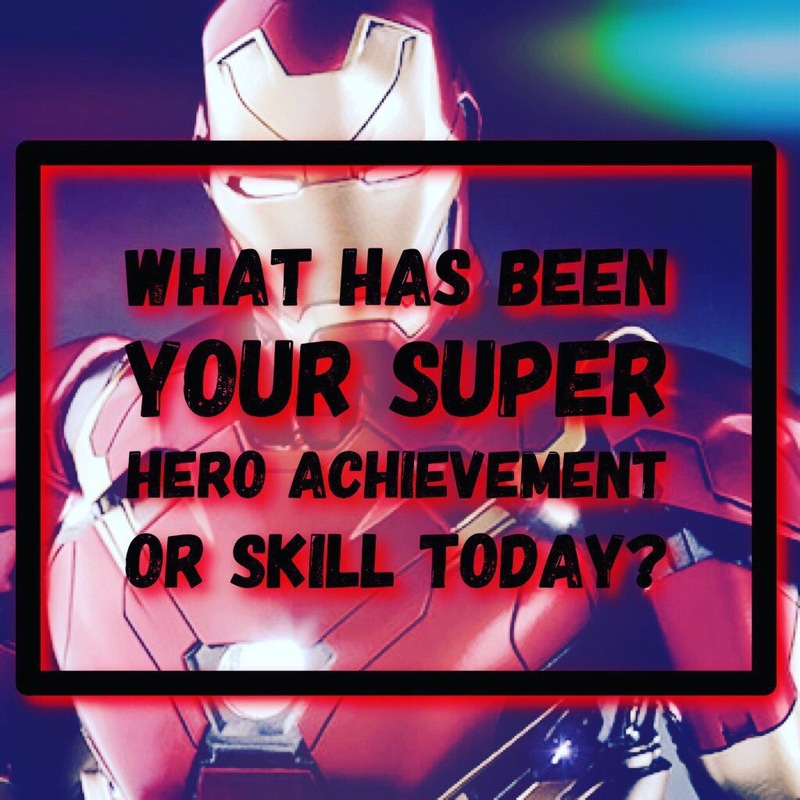 Again, reflecting on the lesson but with a super hero theme that can link in with positivity, praise, success and skills. Most pupils love social media from Facebook, Instagram, Twitter and Snapchat. In another blog I wrote about how I used Snapchat starters as a way to engage students. The social media templates are great because pupils find them to be relevant to them and they can be used in different ways to reflect on the lesson. 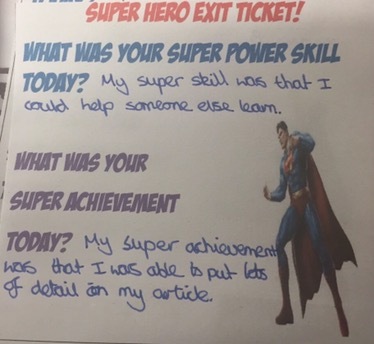 I made this exit ticket for pupils to focus on the skills they had been developing throughout the lesson or unit. 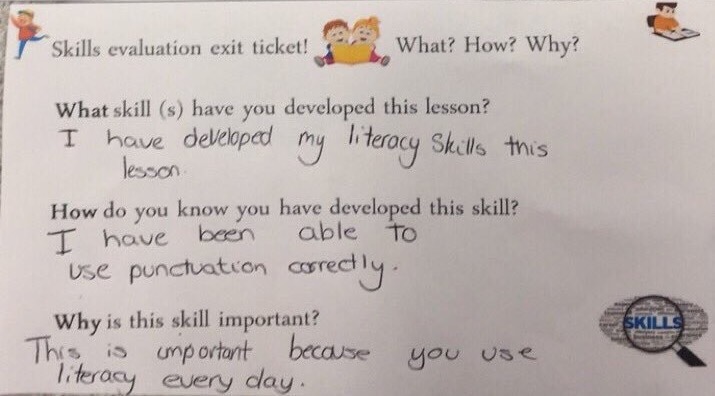 Often pupils focus on the content and recall key facts when completing an exit ticket. However, this task made students think about the different skills they had developed and how they could apply these skills elsewhere. Again, a cross curricular exit ticket. Welcome to *insert your name or school* airways! I made the boarding pass template (shown below) generic so I could use it with all my classes and other teachers at my College could use it across the different subjects. Personalising the boarding pass to your school or class with color and/or emblem also adds an extra touch! 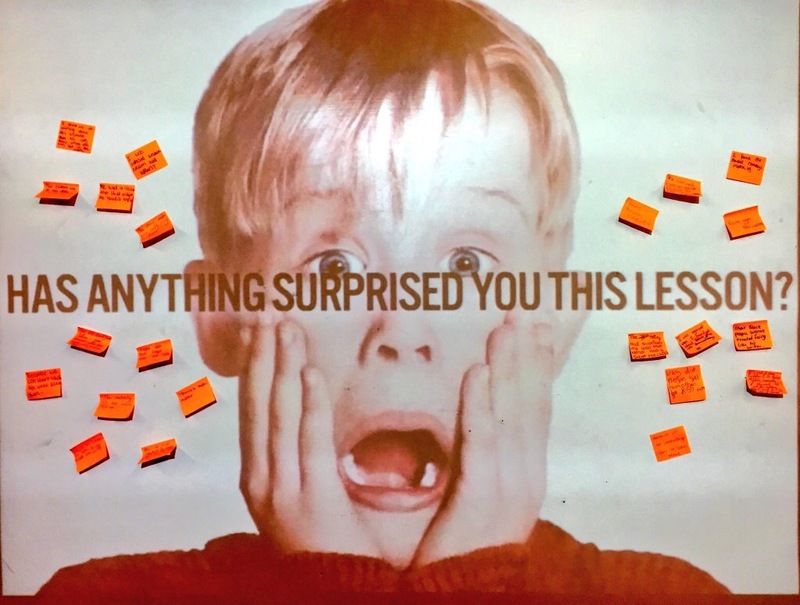 Post it notes are often a key component of every teacher’s toolkit as they can be used in so many different ways! Post it notes are perfect for exit tickets! A reflection question or questions can be projected on the board for students to answer on their post it note then stick on the board. A lovely activity can be to read the exit ticket post it notes out to the rest of the class and open for discussion. They can be glued into students books or kept to be used to recap at the start of next lesson. Post it note plus is a great app for taking pictures of post it notes and saving students work. Another method of collecting exit tickets could be to stand by the door, and collect as students leave the classroom although this is not always possible! I created traffic light coloured wallets for pupils to place their exit tickets at the end of the lesson. This was very basic but effective using the red amber green colours to again self reflect. 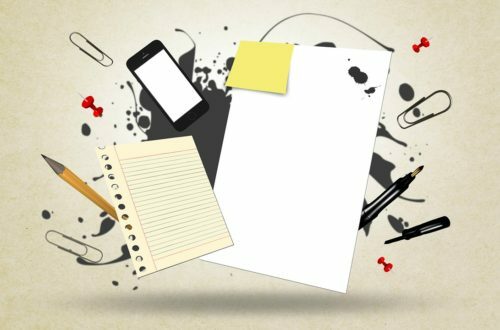 Hello, I find the exit ticket a great tool and I really like your templates. Where can I find them?